We look forward to sharing Tom Sawyer and Huckleberry Finn-like stories of adventure as the intrepid riders take on daily routes of 15 to 85 miles, riding through rural and urban America. Traveling in “packs” ranging from a few as one to as many as 33, we will climb mountains, sing to cows, pedal through swamplands, navigate traffic, and see the world from a unique perspective. We will actively seek encounters with interesting characters along the way at local eateries, swimming pools with hot tubs, and friendly neighbors willing to refill our water bottles in the middle of nowhere. Camaraderie – We were interested in a novel and fun way to bring the company together beyond the tasks we deal with nine-to-five. We created an “outward bound” style challenge that covers over 2,000 miles, passing through 11 states (with secondary day rides in Colorado, California, and the United Kingdom). One –hundred twenty riders. Eighty volunteer contributors. We expect magnificent team connections to occur naturally in route with riders sharing a common task of completing the day’s ride intact. We also expect spontaneous bonding inspired by adverse necessity. Just like outward bound, we expect numerous opportunities for daily creative problem solving by the riders and support team to manage any blind spots not considered by the (self-organized) planning group as well as other impossible-to-predict events. Health – We wanted to promote healthy behaviors within the company, encouraging staff, family, and associates to challenge ourselves and our physical activity comfort zones. We know cycling does not appeal to everyone. Although this particular event involves two wheels and pedals, it is also fundamentally about getting people to think about and hopefully act on physical movement in whatever mode works best. To prove that we are not biased, for next year we are pondering swimming the Mississippi River from St. Paul, Minnesota to New Orleans, Louisiana (kidding, of course)! On the other hand we may settle for a short (less than a mile) walk, like the distance from our State Street office to the Boston Common. Advocacy – We sought a fresh approach to address the continued challenge of placing behavioral health wellness squarely in the mainstream of daily life. We are using the ride as a platform and yet one more opportunity to push our core messages: behavioral health matters, treatments work, life gets better, and people recover. We are focusing our ride’s fundraising efforts in support of two national partners in this domain: Mental Health America (MHA) and National Alliance on Mental Illness (NAMI) and their associated programs that promote these ideas. In several locations along the route, our participants will meet with individuals from the community and local organizations to share this message. We look forward to all participants arriving safely, tired but inspired, in their nightly designated destinations. 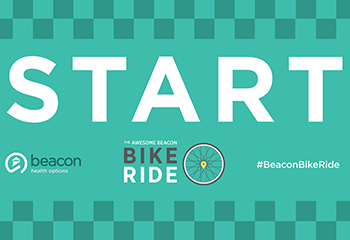 We invite you to follow the progress of the Awesome Beacon Bike Ride here. If you are stirred to contribute to the cause with a donation to MHA or NAMI, please visit our official site. You can even order a collector’s edition memorial ride t-shirt while you are there! Best of luck to all my colleagues! Cheering you on from Chicago!